Foundation of Old Township Hall after its demolition. This was located on South Side of Knott St. and at west side of Heritage Park. A new shelter house was built out on this site. Note outdoor toilet in background. 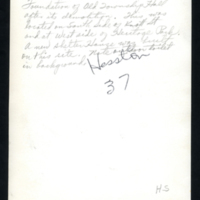 -- handwritten on back of photograph. 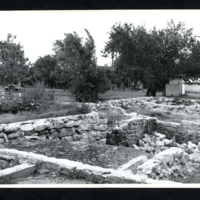 unknown, “Foundation of Old Township Hall,” Hesston Public Library, accessed April 25, 2019, https://hesston.digitalsckls.info/item/1437. 5.25 in. x 6.25 in.